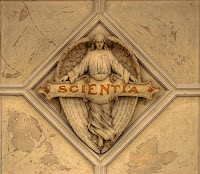 A new edition of Scientia Pro Publica is up on Greg Laden's Blog. Especially recommended comes a post at PodBlack Cat about sleepwalkers. From the paper: "Common features of sexsomnia include sexual arousal with autonomic activation (e.g. nocturnal erection, vaginal lubrication, nocturnal emission, dream orgasms)." That's not exactly what comes to mind when thinking of sleepsex, I suppose, but still a fascinating topic. What makes the supernatural natural?